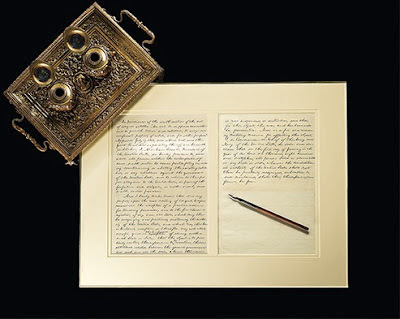 "Lincoln was not the lone force behind emancipation but rather an essential part of a coalition of outspoken abolitionists that included free blacks and whites, said Lonnie G. Bunch III, director of the Smithsonian's National Museum of African American History and Culture and one of the curators of the Smithsonian’s 150th Emancipation Proclamation anniversary exhibit. [...] "When you understand that freedom was a process, not a moment, then you can allow yourself to wonder what work is left for us in the next 100 years." There's more work to be done, but at least we can see the artifacts of emancipation at the Smithsonian! MIT Scaling Development Ventures ~ Social Acts! Trifid Nebula ~ NASA on Dusty Glow Emissions! Burj Eye View ~ Interactive Pinnacle Panorama! Aerial Seaview ~ Quapter Camera Perspective! Better Blocks ~ Jason Roberts' Pop-Up Planning! Inspiring Uhura ~ Nichelle Nichols on Star Trek! Vital Inhabitats ~ Greenscrapers & Skygardens! Treehugger's Apartment ~ Transforming Space! Solar Ballet ~ NASA Spots Dramatic Prominence! Healthcare Hero ~ Congolese Docteur Mukwege! Fictional Skyscrapers ~ Supertalls in Storylines! End of Manhattantown ~ Tragic Urban "Renewal"
Live Action Toy Story ~ Pauley & Perrotta @ Play! Orion Bullets ~ NASA on Hot Gas Cloud Wakes! Digital Globes ~ NYTimes on Epic Display Orbs! Political Typology ~ Quiz on Where Do You Fit? Urban Prototyping ~ Future City LEGO Modeling! Greenroofs ~ Tasty Ecological Urban Penthouses! Census Dotmap ~ Visualizing North Americans! GravityLight ~ Deciwatt's Cheap Lamp Solution! Dhaka's 1st Busmap ~ Urban Launchpad Kicks-it!